SiteGround vs HostGator 2019: Which is Actually Better? As you may already know website hosting is the foundation a website is built on it can easily make or break a website. Creating a website with poor web hosting is like building a house on quicksand eventually you will run into structural problems. That is why it’s important to make sure you choose the best website hosting that works for you. In fact, there are some key differences between website hosting that can make it a good or bad fit for the user hence it’s important to know what makes a website hosting different from the other. This will be a comparison review article that will break down the key differences between HostGator and SiteGround two of the most popular website hostings on the market. Who wins: Siteground or Hostgator? SiteGround vs HostGator WordPress Integration? Although both are excellent at integrating WordPress with just one-click the starting prices for their WordPress plans is a lot lower than most competitors. Siteground quite frankly is better integrated into WordPress, In fact, it is one of the three providers recommended by WordPress (The others being Bluehost and Dreamhost). 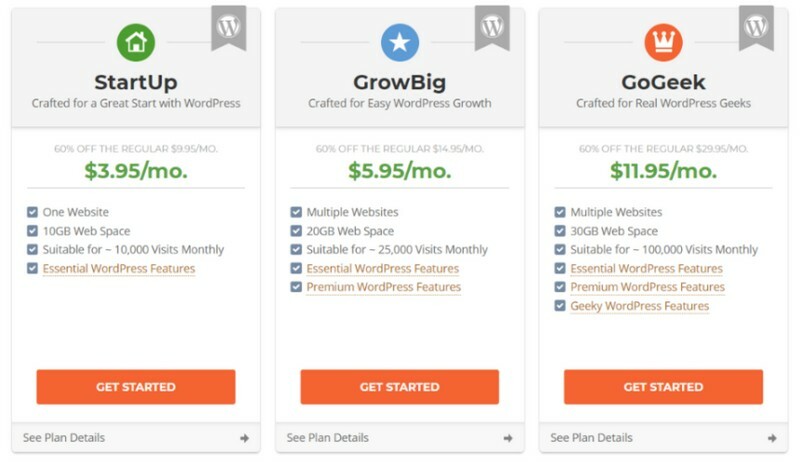 Even their cheapest plan comes with essential WordPress features some with terrific value for the buck. I have to admit this is going to be a really close comparison since both SiteGround and Hostgator are among the best website hosting services in the world. However, if you look at some of the key factors that make a good website server and look at the comparison it is quite clear to find out which the better choice. Although the comparison between Siteground and Hostgator is definitely a close one I will rate each key metric on a scale of 5 so as to make sure it is clear as to which one is better. Fun Fact: SiteGround is one of the only 3 hosts worldwide that is recommended by the WordPress organization. This recommendation with good reason as SiteGround offers a technology environment that is specifically optimized for WordPress websites. Uptime is a critical measurement of web hosting it is the total amount of time a company’s servers are up, operational and effective serving websites for their clients. SiteGround has a guarantee of 99.9% uptime. This guarantee applies across the board, no matter what server plan you have. However much of their strength is in their custom programming, like detection system they built which detects potential downtime problems and automatically fixes them. SiteGround tracks all servers on a real-time basis which is much more efficient than much of the competitors who track it within 1-5 minutes. Problems get fixed much faster and there’s less downtime overall as compared to another hosting. Similarly, HostGator also guarantees to deliver a 99.7% uptime guarantee. Note: The word “guarantee” has is quite questionable because if they don’t reach this level, they’re not obliged to give you credit for the next month of hosting. You get this guarantee whether regardless of if you purchase the smallest budget plan, the reseller plan or simply utilize their most sophisticated dedicated server technology. A separate guarantee the offer is additional coverage for Network clients. The verdict: Siteground has a better uptime compared to Hostgator. To measure them accurately I will use an important metric called TFFB (Time to First Byte) which defines how quickly the host’s server sends the first byte of data when responding to a request. SiteGround has fast and good quality server speed based on a unique quality of many open-source projects: They respond extremely well to caching systems. Moreover, their significant investment in VPS servers that use the Supermicro Server Chassis, Dual AMD Opteron CPUs, SuperCacher and RAID 10 Disk arrays definitely give them a boost compared to Hostgator. Fun Fact: SiteGround built the SuperCacher, a custom-made caching plugin that keeps things moving fast. HostGator, on the other hand, is more focused on employing good equipment and extra server layers to allow faster speeds and better overall service. Fun Fact: If you’re in Australia you’ll experience better speeds as compared to Siteground as the latter doesn’t have a data center but the former does. The Verdict: Siteground is better. The average speed of a website hosted on SiteGround (Optimized 10 sites): 1.1 seconds while on HostGator (Optimized 10 sites): 1.25 seconds. Based on these results the inference is clear on Siteground being better in terms of pure speed. Fundamentally a web server is a really huge hard drive in an off-site, secure location. You know those huge rooms with lots of geeky-looking hardware stacked on top of each other like towers. The speed of the machines will make a big impact on how fast your website is going to be. 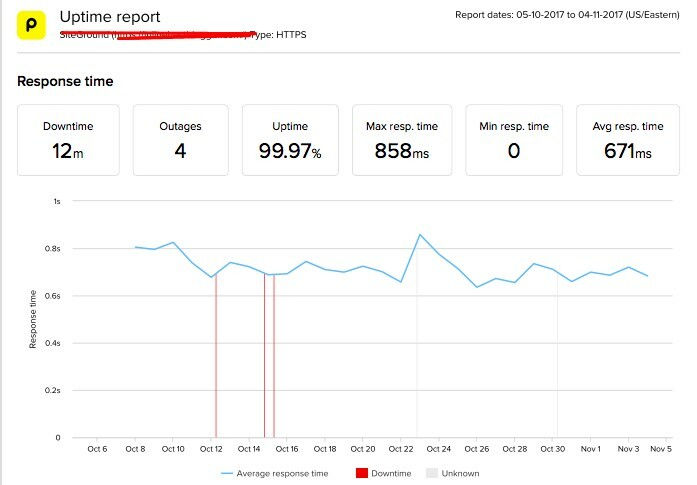 However SiteGround, who put customer support and satisfaction before anything, intentionally keep their server loads low! This is because now there is room to allow for spikes and surges and other seasonal increases, like during holidays towards the end of the year. HostGator, on the other hand, has a pretty impressive battery of server array, which work in perfect harmony to keep a balance and ensure stability. The Verdict: Although benchmarks are not exactly accurate as most of them are on dedicated servers whilst most customers use a shared hosting plan it is evident that Siteground is great at handling high server loads with their unique approach as compared to Hostgator. The location of the hosting provider’s data centers is extremely important for your business as the speed at which your customers can access your website depends on how near they are to the data center you choose. Datacenter security and backup facilities are also important to ensure that your website remains online as much as possible. HostGator’s partnership with Softlayer has allowed them to have data centers in multiple locations. Softlayer owns some of the best data centers in the world equipped with power generators, various power feeds and constant server monitoring along with the best UPS backup facilities. Siteground, on the other hand, owns three data centers located in Chicago, Amsterdam, and Singapore. These are also equipped with some hardware of the finest quality. These data centers also have physical security so that the client’s’ website data is much more secure at all times. Moreover, SiteGround has these data centers in strategically chosen areas to help provide its users with faster processing based on their location. To top that off, it offers free CDN as well, which adds huge 23 locations around the world to improve the efficiency of their client’s websites. Fun Fact: SiteGround plans use Cloudflare CDN (content delivery network). This means your site will be able to be delivered to visitors from about 100 data centers instead of relying on just one. The network will detect which one is closest to your web visitor and serve the website nearest to them. Quality over Quantity as Siteground have complete ownership over their data centers they without any doubt have a superior infrastructure to offer better hosting services. Website hosting is definitely one of the highest drives that increase the cost of starting a website. Due to the high cost, it is extremely important to invest in something that will work effectively and efficiently to support your website especially since beginners don’t have the capacity to shell out thousands of dollar over hosting. HostGator offers 3 upgradable plans for shared web hosting that start at $3.96 a month. Just like HostGator, SiteGround also has three shared website hosting plans that can also be upgraded in the future. Note: Monthly limit of these plans is 100,000 visits which are perfect for bloggers and marketers. The Verdict: What has a better pricing plan? Both companies have similar comparable features being offered at almost the same prices, however, the amount of discounts you get with SiteGround is much better than many other web hosting services including HostGator. You basically get the same great features that SiteGround brings with it, but for half the price. What’s not to love? Note: The renewal costs on Siteground is quite high so make sure you get a longer plan to save more in the long run. The reason I mentioned both Customer care and technical support is that they are both quite different. While the former is provided by most hosting companies much of them outsource customer support executives from overseas who have little to no idea about dealing with technical issues. While many website hosting services make it their mission to provide their customers with the best technical help and care some budget hosting providers like GoDaddy do not invest in good customer care. Good customer care and technical support are essential due to the sophisticated nature of website maintenance. In fact, this may alone be the reason many people to choose one service over another because a good solid customer support is absolutely crucial when it comes to small businesses, especially because much of these servers are do not have any technicians specialized for web-based problems. Both Siteground and Hostgator offer great technical support, including a 24/7 phone support as well as a Live Chat support. 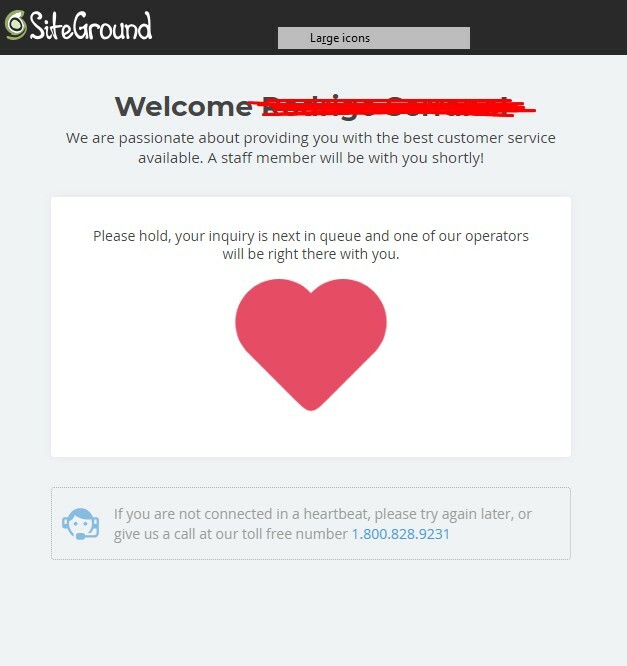 There really isn’t any room to deter either service in the support area, but my own experience has been quite positive with SiteGround. SiteGround offers Call support and in addition to that both chat and an email-oriented ticket based system. 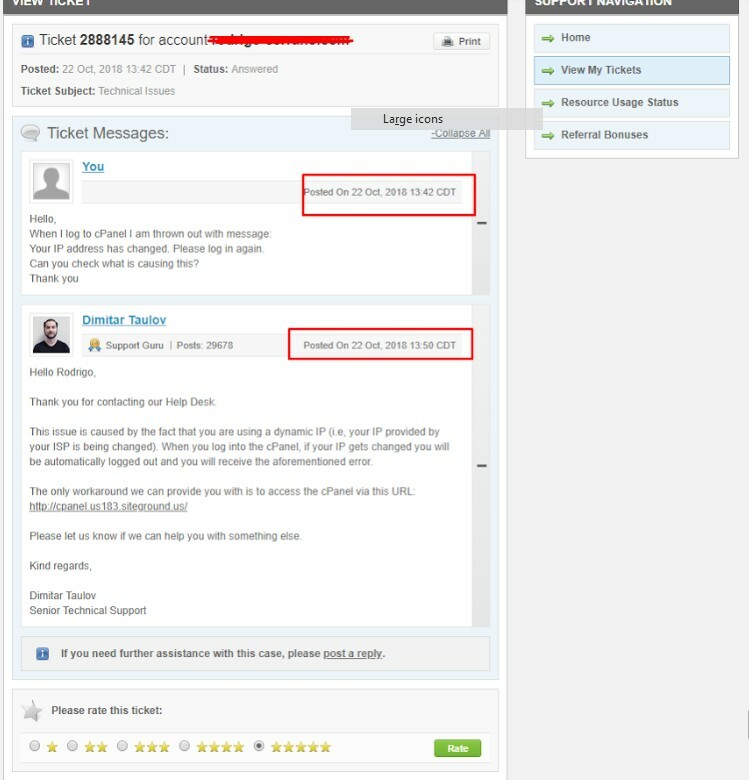 The ticket system boasts a “first reply” within ten minutes, while live chat and telephone support are almost instant! For instance, recently I had a technical issue which had to be transferred to technical support the expected response time was 2 hours but I received a reply and in less than 10 minutes my technical issue was resolved. 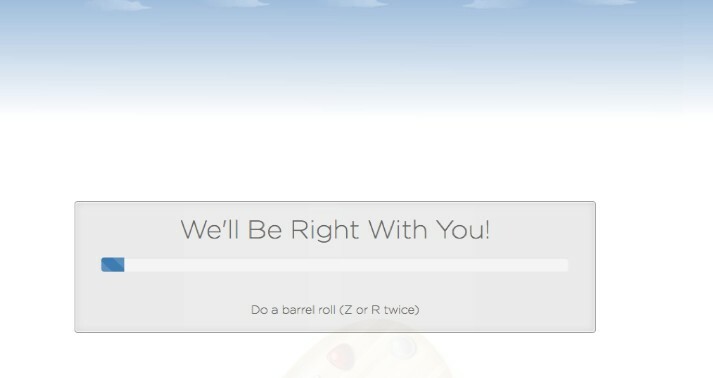 HostGator has a great support team as well. Their executives are competent to help you with support be it complex or general support. In fact, they have been beefing up their support to deal with their strong growth in the last few years. They have built an entire support panel on their site with quick access to live chat if required. The Verdict: What has better customer support? Siteground Customer Support is definitely on another level when it comes to customer support, in fact, thousands of customer reviews and interactions with Siteground. On the whole, the support panel is more intuitive with a better response time compared to Hostgator. Although both are extremely great at customer support Siteground is above most competitors when it comes to customer support which is why SiteGround will have to take this one. There is also a customer forum with lots of quality content built up over years of service and a great documentation repository of helpful guides. The type of control panel that is used by your hosting provider is one of the key features you should look out for when choosing a web hosting provider. The Control Panel or Cpanel is where you manage all the backend stuff of your website. This is also where you make major changes with regards to design, coding changes to your website. The ease and flexibility in using the control panel also play a huge role in the successful and quick development of your website as you have to visit it quite often. 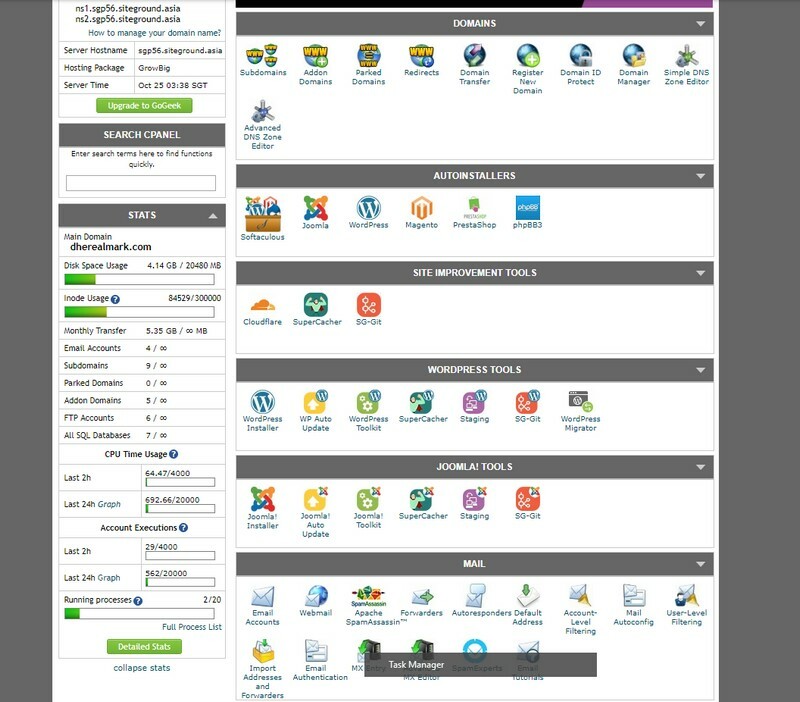 As both these hosting use Cpanel as their control panel there isn’t much difference, to be frank. With only a few exceptions in the design and few feature changes, most of the functionalities are pretty much the same. One thing to note is that HostGator only uses cPanel only with a select plan that is Hatchling, Baby, and Business plans. Whereas for the other plans i.e VPS with Plesk, Windows Shared, and Windows Dedicated hosting plans it uses Plesk control panel. Although Plesk and cPanel offer many similar features Plesk is highly regarded as having a cleaner control panel interface by people in the industry. The verdict: Both are equally as good. This includes everything “extra” the two web hosting services do apart from just hosting a website. These add-ons are often overlooked by a majority of people, for instance, anti-malware scans, backups etc. but they can come in extremely handy in the future. Moreover, if you are a beginner or someone with limited web development knowledge, it will be a tedious task for you to transfer your existing website from your current hosting to the newly chosen one. SiteGround makes this process quite simple and easy with their expert website specialists who will help you in transferring your website in only less than 24 hours! While this may be a paid service in most cases, this service comes absolutely free of cost! This is another feature where SiteGround comes on top as it offers free daily backups and is actually really beneficial if you screw up and need to move back. Fun Fact: SiteGround using Isolated and encrypted servers so that if somebody else’s website is compromised yours is still safe. This SiteGround video depicts the concept and value of isolated servers. You will get a free domain name for when you sign up for one of the Siteground plans on offer for the first time. After the initial 12 months or term is over you’ll need to pay a fee to continue having ownership of the domain name. You will also have a free website builder to assist you in creating your new website. I’ve personally used this service from Siteground plenty of times and the process has been nothing short of seamless. 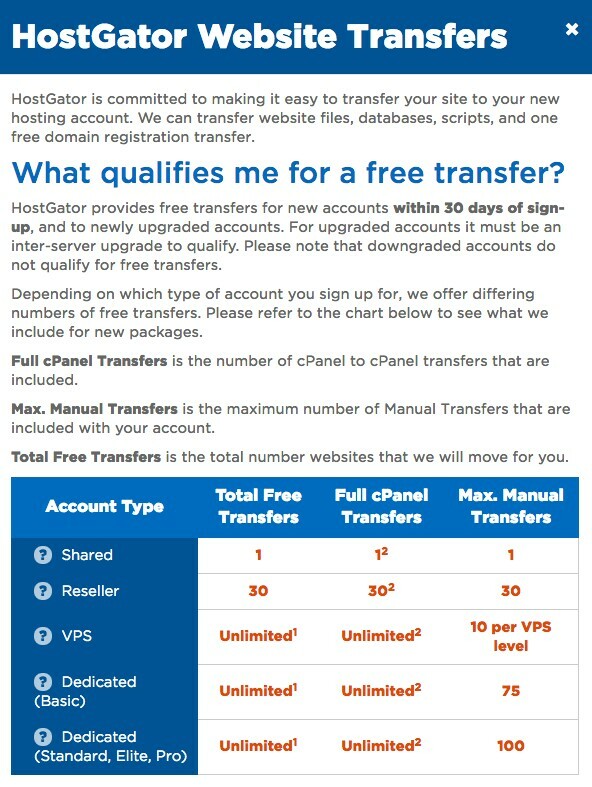 Although I haven’t personally used HostGator’s free website transfer I provided an image from their website that explains all the terms and conditions for the same below. HostGator has invested in some of the finest infrastructures with high-quality cooling systems, fire suppressors, smoke detectors, diesel generators and an uninterrupted power supply in case power is lost even for a single minute. In fact, they have gone so far as to secure their entrances with biometric locks and have a couple of security guards patrol the center as well as a diligent CCTV monitoring that works around the clock. As compared to Siteground 30-day money-back guarantee HostGator offers a longer than usual 45-day money-back refund policy only to people with new contracts. However, this isn’t as clear as it may seem as it only applies to the actual cost of the hosting plan. So basically the admin fees, domain name costs and other add-ons you choose to use are not going to be refunded. Also, the refund will only apply if you made the initial payment via credit card. Otherwise, they will give you a credit to your account. So Who Wins: Siteground or Hostgator? I’ve taken a good look at most of the features and benefits of Siteground and HostGator which are presently one of the most prominent web hosting services on the Internet. This is definitely a difficult comparison because both HostGator and SiteGround are among the best web hosting services available in the market today. Moreover, both of them have a strong customer base as well as a driving motivation to grow and improve further. Both Siteground and HostGator boast great features and pricing plans, as well as top-notch customer and technical support. They have the finest hardware and the software to beat many other services quite easily. You really can’t go wrong with either service as both of them have a loyal client base that testifies to their competency however based on the metrics I’ve chosen which are the bare essentials of a good server it is quite clear which is the better choice. Basically, Siteground is the better choice! It has better servers, pricing (at the start) and performance. Many of its users including myself claim that Siteground has the best customer support. 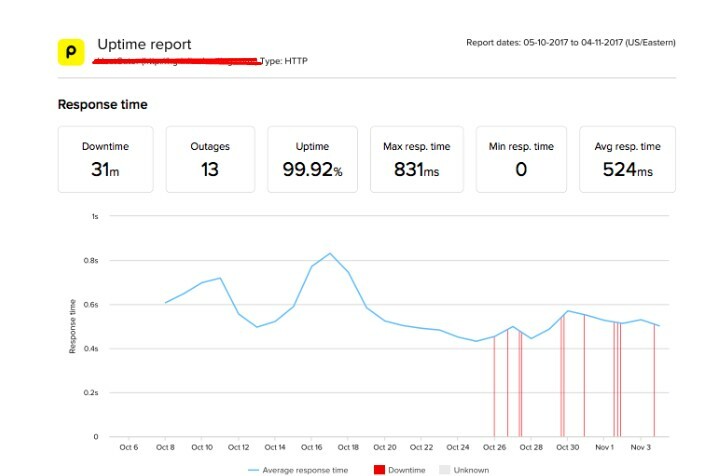 I haven’t experienced any server related issues with Siteground and they are definitely better based on the tests I discussed earlier. Add to that the heavy discount and promotion of about 70% off makes it an absolute no-brainer to get Siteground over HostGator.